see the above pic. The lower gears all seem to mesh fine and don't seem to be shifted from position or have any damage. with the gear train out I can engage the forks and put it in gear and they all pass through without an issue, which is not very helpful with pinpointing the problem. 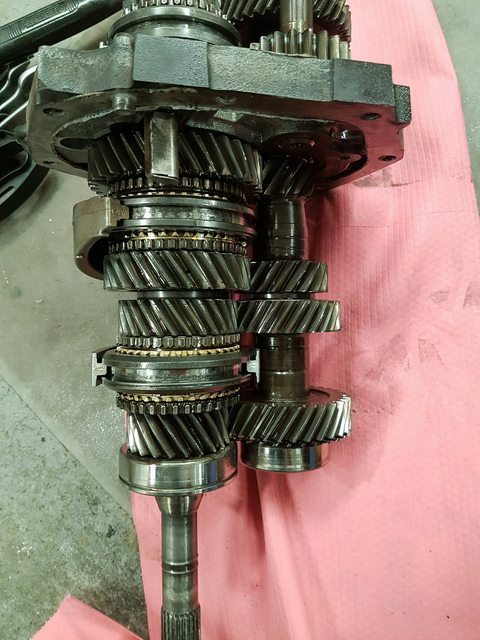 I wonder if something with the shift fork could have gotten bent enough where it is not allowing the gears to engage, but that is a pretty beefy mechanism so I am having a hard time seeing what that could be. after I took the transmission out the first time and replaced the clutch, I was able to run the thing for a few days without any apparent issue. So i think it has to be something to do with the linkage. from looking at the FSM everything is pinned and tight so it boggles my mind what could have gotten wacked out. Last edited by estomax; 11-25-2017 at 10:15 PM.